I was recently asked how you can spell-check in Spanish in Word (assuming that Word is running in an English environment). I knew the old way, but realized that it had probably changed in Word 2007 because of the new tab layout. I looked for updated instructions, but I couldn't find one in a quick Google search. So I did some field research which I thought I would document it. Go to the Tools » Language » Set Language. A pop-window will open where you can select an appropriate language. Three current terms for the field of wrangling non-English text include i18n for "internationalization", g11n for "globalization" (both refer to making content/systems usable to people using any script) and the related l10n "localization" (adapting information from region one to a second region, (e.g. a Japanese product sold in the United States). These terms have the same structure start with the first letter, end with the last letter and insert the number of letters in between. Thus internationalization (20 letters total, 18 between "i" and "n") becomes i18n. FYI - Both r10n and t13n refer to the process of writing any language in the Roman (Western/Latin) alphabet. Japanese Romāji is an example of this process. Before the days of Unicode, each region had established its own encoding standard for its own language(s). The most famous may be ASCII (American Standard Code for Information Interchange) from which we also got VISCII (Vietnamese), ISCII (India) and ArmSCII (Armenian). Another pattern is to name the encoding standard after the governmental standards body and the number of the encoding scheme (usually a sequential number). This is how we arrive at TIS-620 (Thailand, Thai Industrial Standard #620), GB3212 (China) and ELOT 928 (Greece/Ellas). A governmental agency also gave names to Shift-JIS (Japan, combination of JIS X 0201 and JIS X 0208) and ANSI (U.S., American National Standards Institute). Finally, if for some reason, the local government doesn't move as rapidly as needed , then a corporation will invent its own standard on the fly. In the U.S. we got both Windows-1252 (Win-1252) and MacRoman encodings this way. In Taiwan, they got Big5 (a Traditional Chinese encoding standard agreed upon by five corporations). In the future, I will assume that each Star Trek planet has its own version of Unicode, but of course each will have its own encoding designation. Can you Star Trek fans guess where these are from? Final challenge - what encoding would you invent for the Cardassians? Below is the Braille Symbol "1-4-5" which is encoded in Unicode. As you can see it is named for the configuration of the dots, not for a letter. As it happens, this pattern is used for English letter D as well as for delta (Δ) in Greek, dalet (ד) in Hebrew, dal (د) in Arabic and letter (Д) in Russian. When Braille was first developed, only six cells were used, but in Unicode cells 7 and 8 were added to expand the repertoire of possible characters. Most Braille software and hardware are devoted to visually impaired users, but there are fonts for sighted users. Below is a list of links to Braille charts by language and freeware Braille fonts. A revised post with complete instructions for JAWS 13 is now available on this blog. 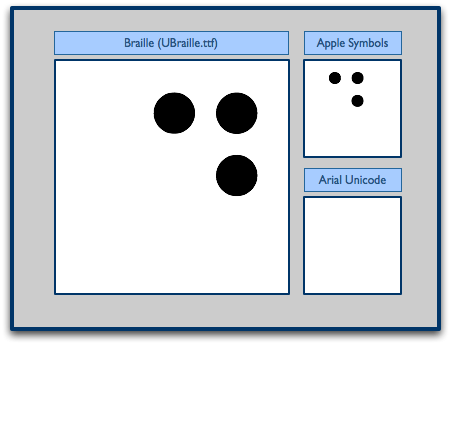 This article from a Caroll Tech accessibility blog explains how users of JAWS 6.1+ can tweak their symbol (.sbl) files so that certain code points are pronounced accurately. For instance, you could program /ŋ/ (U+014B) to be pronounced as "engma" (FYI - /ŋ/ is the "ng" sound in "sing, song"). Other files may also be available online via a Google search.